wow, that is overly tempting! I re-discovered nutella quite recently too. It was on special at the supermarket, so I bought a jar. I had some on a sandwich with crunchy peanut butter, it was amazing! I am going to try not to eat it too often! Oh, first I see these beautifully swirled confections, then I see your lovely gingerbread chocolate hearts. That's it. I'm having some chocolate tonight for dessert. I love nutella, and like you could gladly eat it from the jar. It has to be nutella though as no other chocolate spread comes close. After seeing these delicious looking cups I craving nutella! Oh those do look incredibly yummy Nic! I did some cookies and a nutella hot choccie on my blog for Nutella day. Incredible as it seems I never got turned on to Nutella until just a year or so ago! I KNOW! I must have been living in a cave!!! What a brilliantly simple but hugely effective creation! Fabulous, and so pretty, too! Mmmm that looks like the perfect use for Nutella - can't wait to try it out! Holler - I love it with peanut butter too! So tempting to just keep dipping in!! Susan - I don't know why but February seems to be bringing out the chocolate in everyone! Jules - I agree, got to be Nutella! Marie - Well, I didn't buy any for years and love it now! aforkfulofspaghetti - thanks, they are pretty simple to make, must rmember not to make them too often though!! Alfie - thanks for visiting and hope you like them if you make any! I definitely wouldn't be able to eat just one, they look great! Sorry, Only send 1/2 a cooments. Her's the rest. I don't stand a chance. Will have to think up something diff. I didn't enter because I didn't have any ideas of what to make. No problem for next year. I've now got plenty of yummy possibilities. I could do with one of those little wonders right now. Nic, what a lovely looking goodie. It's a good job lent has started otherwise I'd be round at yours to pinch some in a jiffy. Wow, wow, wow. I am floored, they look so decadent (and delicious!). Whipped cream and Nutella, you are an evil genius! :) It must be so wonderful to bite into one of these with both the creaminess and the crunchiness, gorgeous! How fabulous they are. So so pretty. A confession - I've never eaten Nutella, perhaps now is the time to try some. Bleeding Espresso - Well done on your round-up! Rosie - banana is great with Nutella as well! Brilynn - no, I think it's near impossible to stop at one. Nina - thanks for visiting Nina! Great minds eh? Vanielje - yep, there's a ton of ideas over at the round-ups! Miri - your Nutella filled rolled cookies look delicious too! Sylvie - you are very good to be giving up chocolate for lent! Cakespy - thanks, thanks, thanks! LyB - ha, ha! I've never been called an evil genius before (!) my husband would agree with the 'evil' for sure!! Margaret - you should definitely give it a go - it's on special at Sainsbury's at the moment, there's a 1/3 off off of the 400g size, it's 97p. 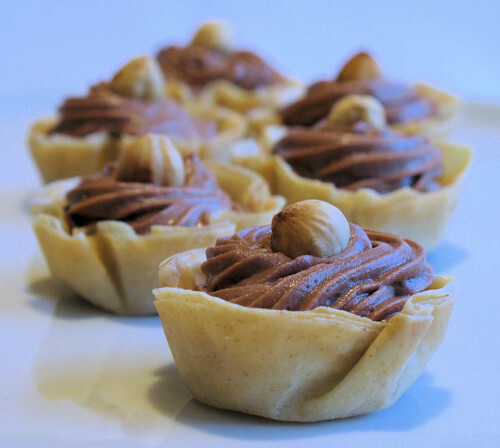 all of us have such fond memories of Nutella , it was until this event that i even realized that there is a world nutella day !These Filo cups really do live up to the occasion and they look incredibly cute. That looks wonderfully naughty but nice. :) You have such a beautiful looking blog; it's a pleasure to visit and view all your gorgeous recipes. Margot - I don't think you need a special day to enjoy a bit of Nutella! Thanks for the lovely comments. Kate/Kajal - thanks, and I didn't know about Nutella Day either!! Pixie - thank you so much - you make my day with comments like that! 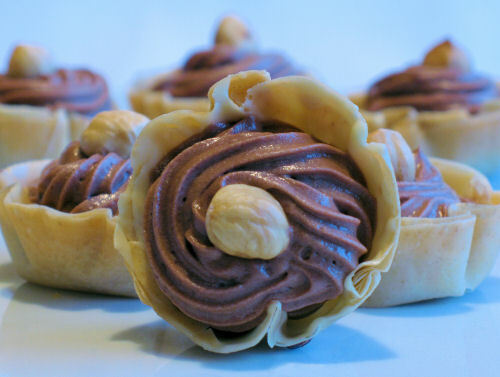 The first time reading your blog, the first thing I see is your picture of the Nutella Filo Cups. Now if that isn't a great hook, I don't know what is! Those look DELICIOUS, and although I'm ashamed to say I have never tried Nutella, I'm definitely going to have to go buy a jar and try these! Allison - thank you so much for your fabulous comments, I am so glad you enjoyed my blog. And you should try a small jar, you never know - you may love it!! Rosie - happy Valentines Day to you to, thanks for the rose! 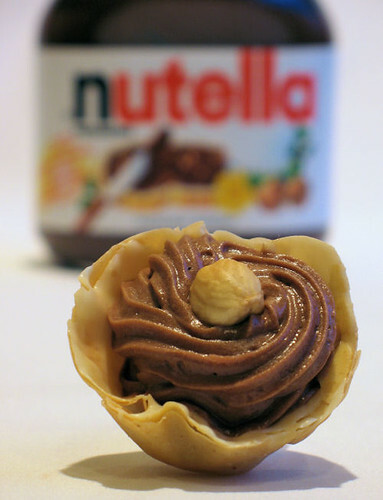 Your nutella cups look so very tempting! All these wonderful nutella recipes floating around - so many to choose from, how wonderful. Thanks Pixie - and you are so right about there being so many Nutella recipes around. Allison - You have gone and done it now! I hope you're not going to blame your new addiction on me!!! OMG you truly are an evil mastermind!! I haven't really thought about Nutella in years, and now I can think of little else...!